ah, but variety IS the spice of life … somebody said. 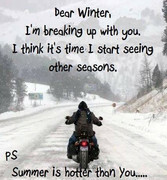 But that said, I'm all for divorcing winter! Irreconcilable differences.